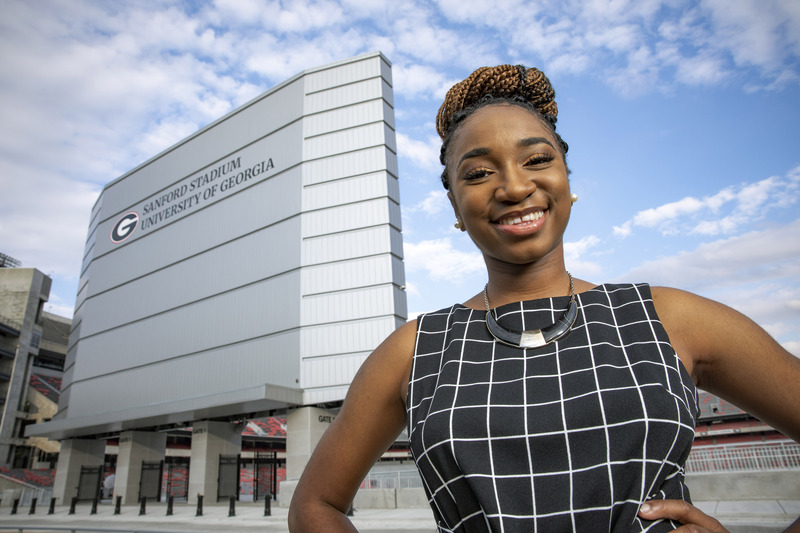 Omowunmi Oni, a senior who is planning a career in dentistry, says she is confident that she was destined to attend UGA because she has received lifelong friendships, great connections and amazing opportunities. I currently have a younger sister at UGA who is a sophomore! These past four years at the University of Georgia has been an amazing experience. Throughout my time here, I have grown tremendously in my personal, academic and professional goals. One of my greatest highlights here at UGA include being a part of the African Student Union. As a member of ASU, I have modeled for events like Africa Night and FeaRed, bringing awareness of African culture and issues into UGA’s campus. I have also been a member of the competition dance team, battling with other ASUs across the state, a memorable experience of bonding with my team. As an executive member of ASU, I have worked as a member of the banquet committee, fundraising chair and public relations chair, allowing me to see the hard work and dedication it takes to make ASU a great organization. With ASU, I was able to make an impact, create lifelong friendships and challenge myself in ways I never expected. Throughout my years at UGA, I have supported various communities. As an RHA representative for ECV, I was able to vouch for my fellow residents in support for their concerns. As a Georgia football ambassador, I hosted recruits during game days, welcoming them to our school. During my sophomore year, I was selected to be part of a 20-member committee of students for the Student Health Advisory Committee, working as a voice of students in health center matters. I am currently a volunteer dental assistant for the Mercy Health Center, a free clinic to benefit those uninsured in Athens. I was fortunate enough to become the lead student researcher in an undergraduate research project titled “Identifying and characterizing the reasons for success of black students in STEM fields.” As a black student in a STEM field myself, I hold this research dear to my heart as it highlights black students who prevail in STEM fields despite all odds. Through this research, I have learned many skills including how to make protocols, conduct interviews and code transcripts. Presenting my research at the Society for the Advancement of Biological Education Research conference (a national conference at the University of Minnesota) and receiving great feedback was a rewarding experience I will always cherish. Some scholarship and award highlights include being a Robert Wood Johnson Foundation/SHPEP and a Louis Stokes Alliances for Minority Participation scholar. All of these highlights are a testament to the various opportunities UGA has to offer, and I am grateful to all the people who have supported me along this journey! If I am being honest, my mom did not want me to leave the state, and I did not want to go to school in the city, so the best option left was UGA. However, I am so confident that I was destined to be here because at UGA, I received lifelong friendships, great connections and amazing opportunities. Some things I love are getting Niche pizza, working out at Ramsey, hanging out in Memorial Hall, and attending any on-campus outdoor event. … to rest! I am a huge advocate for having good mental health and keeping myself stress-free. When I have free time, I like to sleep and treat myself to a “Wunmi day,” which includes watching my favorite movies, eating out and hanging out with the people I love. After resting, my next favorite thing to do is traveling and going on adventures. I visited my home country Nigeria this summer and decided to be independent. I took public transportation all by myself in the very populated and hard-to-navigate city of Lagos, Nigeria. After spending hours stuck in traffic, dealing with shady bus drivers and losing my wallet, I realized that traveling with the comfort of my grandma would not have been so bad after all. … in my bed! As much as I appreciate the 24/7 convenience of MLC or the comfy bean bags in the science library, I love studying from the comfort of my bed. Here I can turn on the TV for background music and be nestled between my pillows. Unfortunately, this usually turns out to be a terrible idea as right after I make this decision, I fall asleep and get no work done. … my research professor, Julie Stanton. Dr. Stanton has become an amazing mentor to me, not only in research, but in my academic and personal goals. Dr. Stanton is one of the most loving and caring professors I know, and I am so happy to have met her! … all of my family members under one roof. All of my family is spread out in America, Nigeria and England, which has hindered us from all being together in a very long time. Although I get to see them separately, being together and enjoying each other’s presence would be an irreplaceable moment. … become an Instagram influencer, sharing my positivity and faith across the world. This way, I would make a huge impact serving the needs of others while supporting myself and traveling wherever possible. My passion in life is to serve wherever I can. As the president of the Nanka School Project, I work to better the quality of education for students in the rural community of Nanka, Nigeria. Students in Nanka lack basic access to school supplies, clean water, adequate teachers and adequate learning environments. My work with the organization here at UGA serves to fundraise for students in Nanka, provide medical and school supplies, empower them through pen pals and promote students here at UGA to enact global change. In addition, we also work in the Athens community to help students here through empowering, cultural engagement and tutoring. I hope to continue with the organization when I become a dentist as with my dental degree, I can provide dental aid to students and community members of Nanka. … hopefully attend dental school! I am not sure exactly where I want to go, but I am excited to get closer toward my career in dentistry. My time spent with the African Student Union. I mentioned it previously, but ASU has been a huge part of providing me joy and challenging me through the years. I am so thankful for the amazing people/mentors/mentees I have met because of this organization!